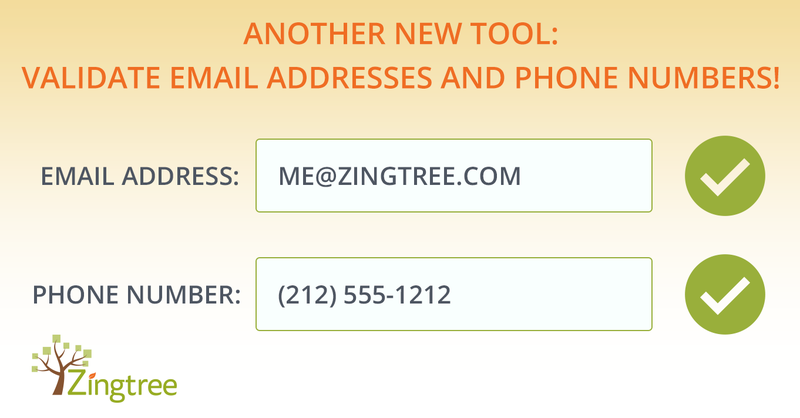 Besides address verification, Zingtree can also validate phone numbers and email addresses entered while collecting data in your decision trees. Since there’s nothing worse than missing an opportunity due to a typo, being able to ensure good clean data is now much easier. The Zingtree Gallery has demonstration trees for validation. Just enter a phone number or email, and move to the next field in the form. A validation status badge appears automatically. Both phone number validation and email validation work world-wide. If your are entering phone numbers for people outside of the USA, you’ll need to prefix them with a plus sign. USA numbers can be entered without a plus. Using the Settings tool, configure your tree to validate phone numbers or email addresses. Use an email or phone field type in the data entry fields in your decision tree nodes. Go to My Trees, and select your tree. Click the Settings tool, and make sure Verify: Phone or Verify: Email is selected. Now, let’s add a phone or email data entry field to a node. From Overview, pick a question node to edit, and click the Edit Tool. Click Add Field, and then Save Changes to save your Node. Please note: Using phone or email validation is an extra cost, usually $0.01 per lookup. When using validation, it’s best to make sure the phone or email field is the first field, or has at least one more field below it. The validation process doesn’t start until the cursor leaves the edit box, so if it’s the last field in the form the validation may never occur. Once a field is validated, you can hover over the validation badge and get more information about the phone number or email address. Try it! Now you have a great new tool to ensure you are getting good, clean data. As always, if you like this feature, or have any comments or suggestions, please tell us!